Premiums written, especially in property and casualty insurance, increased by more than 6.5 per cent, even more strongly than expected and in line with UNIQA’s strategic requirements. It is also pleasing that this significant growth was borne by both core markets: Austria (+4.6 per cent) and CEE (+11.3 per cent). By contrast, premiums written in life insurance fell by 9.4 per cent in line with strategy. This was due primarily to the wide-spread avoidance of new single-premium contracts, which decreased by 55 per cent year-on-year. The health insurance business was very stable, developing as expected in line with the long-term trend (+3.9 per cent). In addition to its premium growth, UNIQA also further improved its operative KPIs. Consistently high cost discipline helped to decrease the cost ratio from 25.9 per cent to 24.9 per cent. In terms of the combined ratio, UNIQA improved to a good 97.4 per cent, after 97.7 per cent in the prior-year period, thus getting another step closer to its target of 95 per cent in 2020. For 2018 as a whole, UNIQA anticipates further growth in property insurance, casualty insurance and health insurance. Despite high expenses for the innovation and investment programme launched in 2016, UNIQA is pursuing further improvement in its earnings before taxes. It is likewise keeping to its plan to continuously increase the annual distribution per share in the years to come as part of a progressive dividend policy. On 24 May 2018, UNIQA will publish its report on the 1st quarter of 2018 as well as its Solvency and Financial Condition Report (SFCR) for 2017, in which it reports its regulatory capital requirement (SCR ratio) of 250 per cent (2016: 202 per cent) a very healthy figure by international standards. Building upon this secure foundation, UNIQA continues to work with full commitment on optimising its actuarial core business while at the same time transforming its business model into a future-oriented one. 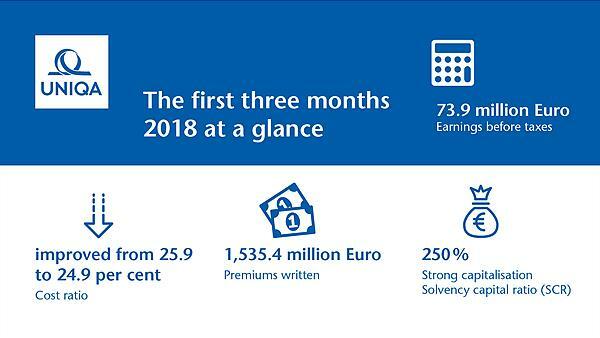 Total premiums written by the UNIQA Group including the savings portion of unit- and index-linked life insurance increased by 1.6 per cent to €1,535.4 million in the first quarter of 2018 (1-3/2017: €1,511.9 million) due to solid growth in property insurance, casualty insurance and health insurance. The recurring premiums this included rose by 4.1 per cent to €1,506.3 million (1-3/2017: €1,446.6 million), while in life insurance they declined by 1.1 per cent to €361.3 million (1 – 3/2017: €386.5 million) and single premiums in life insurance decreased by 55.5 per cent to €29.1 million (1-3/2017: €65.3 million) in line with strategy. Premiums earned including the net savings portion of the premiums from unit- and index-linked life insurance remained at the prior-year level at €1,282.6 million (1-3/2017: €1,279.7 million). Retained premiums earned (in accordance with IFRS) increased by 4.6 per cent to €1,210.6 million (1-3/2017: €1,157.6 million). Premiums written in property and casualty insurance rose in CEE in particular and climbed by 6.5 per cent in the first three months of 2018 to €868.8 million (1-3/2017: €815.7 million). Premiums written in health insurance rose by 3.9 per cent to €280.1 million (1-3/2017: €269.7 million). In life insurance, total premiums written including the savings portion of unit- and index-linked life insurance – driven by the planned reduction of single premiums in international business (Poland) – declined by 9.4 per cent to €386.5 million (1-3/2017: €426.5 million). In international business, premiums written in property and casualty insurance climbed by an impressive 11.3 per cent (1-3/2018: €307.4 million / 1-3/2017: €276.1 million) and those in health insurance by 23.7 per cent (1-3/2018: €19.7 million / 1-3/2017: €16.0 million), while life insurance premiums written fell by 25.0 per cent (1-3/2018: €100.9 million / 1-3/2017: €134.6 million) due to the planned decrease in single premiums, especially in Poland. In summary, UNIQA generated written premiums in international business including savings portions of €428.0 million (+0.3 per cent / 1-3/2017: €426.7 million), recurring premiums included in this rose by 10.3 per cent to €408.8 million (1-3/2017: €370.6 million). In Austria as well, UNIQA recorded a significant increase in property and casualty premiums of 4.6 per cent to € 553.9 million (1-3/2017: € 529.8 million), while health insurance premiums moved up by 2.6 per cent to € 260.4 million (1-3/2017: € 253.8 million). Premiums written in life insurance fell by 2.0 per cent to €283.6 million (1-3/2017: €289.5 million). In total, UNIQA generated pleasing growth in premiums written in Austria including savings portions of 2.3 per cent to €1,097.9 million (1-3/2017: €1,073.0 million). Recurring premiums included in that expanded by a pleasing 2.3 per cent to €1,088.0 million (1-3/2017: € 1,063.8 million). The total amount of retained insurance benefits of the UNIQA Group rose by 8.9 per cent to € 934.9 million in the first quarter of 2018 (1-3/2017: €858.7 million). Total operating expenses less reinsurance commissions received were reduced by 3.4 per cent to € 319.9 million in the first three months of 2018 (1-3/2017: € 331.0 million). Despite premium growth, expenses for acquisition rose by 9.4 per cent to €208.9 million (1-3/2017: €230.6 million). Other operating expenses (administration costs) climbed by 10.5 per cent in the first quarter of 2018 to €110.9 million (1-3/2017: €100.4 million) as a result of higher regulation expenses. The Group cost ratio – the ratio of total operating expenses to premiums earned including the net savings portion of the premiums from unit- and index-linked life insurance – less reinsurance commissions received improved by one percentage point to 24.9 per cent (1-3/2017: 25.9 per cent). Despite a slight increase in the loss ratio, the combined ratio after reinsurance improved to 97.4 per cent (1-3/2017: 97.7 per cent) due to the improved cost situation. Investment income rose by 89.3 per cent to €143.4 million in the first quarter of 2018 (1-3/2017: €75.8 million). The main reason for this strong increase was the sale of the indirect interest in Casinos Austria Aktiengesellschaft, which generated gains on disposal of €47.4 million for the UNIQA Group. The investment portfolio of the UNIQA Group (including investment property, financial assets accounted for using the equity method and other investments) decreased slightly as at 31 March 2018 compared with the end of the previous year to €19,778.8 million (31 December 2017: €19,877.7 million). The underwriting result of the UNIQA Group fell by 40.2 per cent to €24.2 million in the first quarter of 2018 (1-3/2017: €40.4 million) despite an improved cost situation due to an increase in retained insurance benefits in life insurance and health insurance. In contrast, operating earnings increased by 81.6 per cent to €87.2 million (1-3/2017: €48.0 million) due to the good investment result. Earnings before taxes of the UNIQA Group rose accordingly just as significantly by 122.9 per cent to €73.9 million (1-3/2017: €33.1 million). Consolidated net profit (net profit for the period attributable to the shareholders of UNIQA Insurance Group AG) increased by 87.0 per cent to €54.4 million (1-3/2017: €29.1 million). Earnings per share amounted to €0.18 (1-3/2017: €0.09). As at 31 March 2018, the UNIQA Group’s equity amounted to €3,191.1 million (31 December 2017: €3,177.6 million). The average number of employees at the UNIQA Group remained close to stable at 12,810 in the first three months of the year (1-3/2017: 12,803). For the entire 2018 financial year, UNIQA is expecting growth in property and casualty premiums of at least 2 per cent and a rise in premiums in health insurance of at least 3 per cent. In view of the conscious reduction of life insurance single premiums in CEE in particular and continuing customer restraint regarding traditional life insurance in Austria, lower premiums in life insurance are expected. In 2018 as a whole, UNIQA is expecting a moderate decline in total premium volume of about 1 per cent. For investment income, UNIQA is expecting that the downward trend will not continue in 2018, as the impact of low interest rates has already been largely reflected in the lower investment income of previous years. In the area of property and casualty insurance, UNIQA is continuing to strive for increased profitability in its actuarial core business in 2018 as well and on this basis a further increase in the combined ratio compared with 2017. Overall, UNIQA is anticipating an improvement in earnings before taxes for the 2018 financial year despite ongoing high expenses in connection with the innovation and investment program launched in 2016. UNIQA retains its intention of steadily increasing the annual distribution per share in the years to come as part of a progressive dividend policy. UNIQA will publish its Solvency and Financial Condition Report (SFCR) on 24 May at around 8:00 a.m. at www.uniqagroup.com. The 19th Annual General Meeting of UNIQA Insurance Group AG will be held on 28 May. CEO Andreas Brandstetter’s speech will be broadcast live at www.uniqagroup.com from 10:00 a.m. and be available as a recording after the end of the Annual General Meeting. This press release contains statements concerning UNIQA’s future development. These statements present estimates that were reached on the basis of all of the information available to us at the present time. If the assumptions on which they are based do not occur, the actual results may deviate from the results currently expected. As a result, no liability is accepted for this information.